model with a switch-mode universal power supply. bridged-mono mode shall bridge the outputs to provide increased output voltage. Ready Indicator: Green LED, one per channel. On (dim): Onset of compression. Signal Indicators: One green LED per channel. Solid green: Input signal is above –40 dBu. Bright green: Channel’s output signal has reached the onset of audible clipping. Power Switch: Push-on/push-off switch with built-in green AC mains present indicator. to be a level meter. retention clip. Voltage range is indicated above IEC inlet. switch resets the circuit breaker. 5-way binding posts (for banana plugs, spade lugs or bare wire). Mode Switch/Indicator: Sets amplifi er to Stereo, Bridge, or Input Y mode. ch. 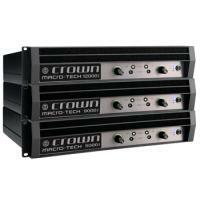 ), 3,600W (4-ohm bridge), and 4,000W (8-ohm bridge). Frequency Response (at 1 watt, 20 Hz - 20 kHz into 8 ohms): ±0.25 dB. Signal to Noise Ratio (below rated full-bandwidth power, A-weighted): > 110 dB. Total Harmonic Distortion (THD) (at 2 watts into 8 ohms): < 0.1%. Network: Onboard HiQnet, compatible with standard 100 Mb Ethercom hardware. channel experiences a catastrophic failure, the entire amplifi er will shut down. in. (8.9 cm) high and 16.2 in. (41.1 cm) deep. Net weight shall be 28 lb (12.7 kg). Shipping weight shall be 36 lb (16.3 kg). 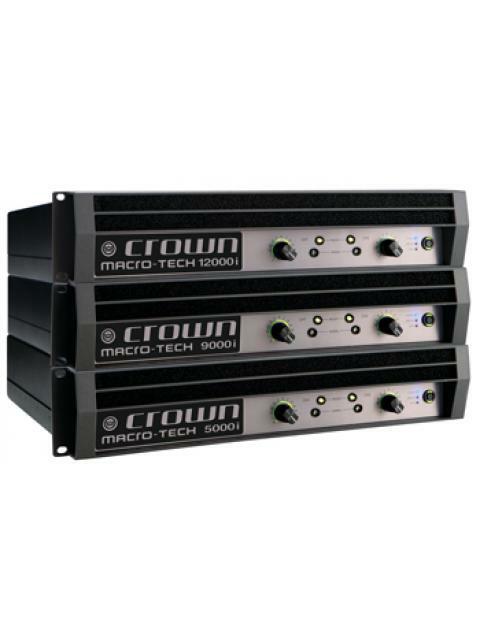 The amplifi er shall be designated the Crown Macro-Tech 5000i.